Abuse it; do not hold back on distressing your sink. The best patina results are from heaviest use. The more dents and scratches the better the appearance. Dropping large heavy objects may cause water to pool. You can not hurt corners with blunt objects. Care should be taken in dropping or throwing large sharp knives and utensils. 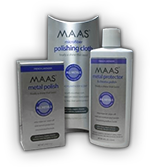 For easiest polishing I recommend “MAAS” metal polish along with a clean soft rag (one can of polish and a cleaning cloth are sent with each new sink for your convenience). Polish once a month and apply a metal protector of your choice after each cleaning. This should help to keep the maintenance of your new sink to a minimum. Remember to use a metal protector to help reduce maintenance. Polishing your sink at least once per month for the first year will help build up a protective coating on your precious metal sink. Do not use silver polish as it will not work as well and may leave a residue. Also remember to wipe your sink dry after each use to reduce the appearance of stain spots. Please note that water spots from soapy rags or stains from pots left in a wet sink for an extended period of time do occasionally occur. To clean stains, use a soft abrasive such as "Blue Magic", "Fitz" or "Brasso" (on stain spots only). You can purchase our recommended cleaning and polishing products by phone at 1-800-978-0024, or online at www.maasinc.com. Soft soap and water can be used for cleaning after each use. Remember to rinse and dry the bottom of your sink after cleaning. Your polish can also be used as a cleaner. We do not recommend that hot pots or pans be placed on German Silver countertops. The metal is very thin and the heat may cause warping and may aid in the loosening of the glue, which may cause the metal surface to pull away from the countertop. For these reason we Do Not warranty countertops. Thank you for your interest in my product.